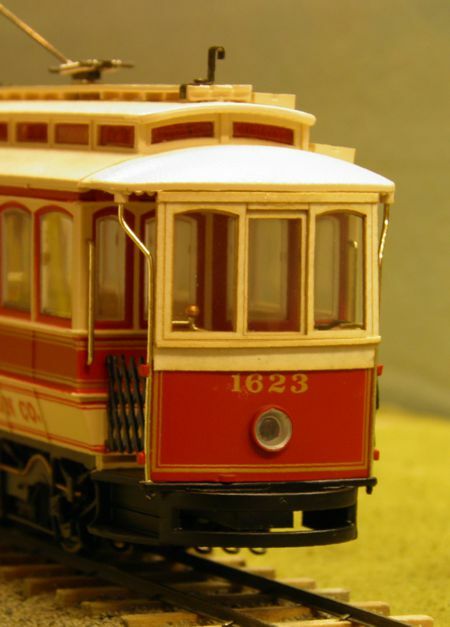 This kit updates the Bachmann On30 Street Car with two semi-enclosed ends similar to the "Portable Vestibules" used after the turn of the century to help weatherize trolleys. For those without a traction element to their layout, new trolley lines initially used a few battery powered trolleys while waiting to install the overhead wiring and power grid system. Removing the trolley pole and wood roof decking from the Bachmann street car easily converts the car to a battery powered trolley. Kit is made from lazerboard with acetate windows and requires basic modeling skills and paint to complete.